Lab created opal ring with blue topaz accents set in sterling silver. 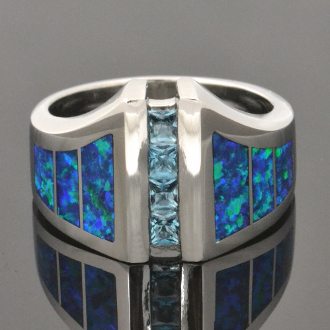 This man's ring is inlaid with bright blue-green synthetic opal that is is a great match with sparkling blue topaz. There are 3 pieces of lab created opal inlaid on each side of the ring. The four princess cut blue topaz total .60 carats and are channel set down the center of the ring. The ring is 15mm wide at the top and tapers down to about 6mm at the bottom. It is available in sizes 8 to 11 by special order in 4 to 6 weeks. Sizes larger than 11 will be a small additional charge. Other inlay stones and colors are also available. This ring is also available in stainless steel and 14k yellow or white gold for an additional charge. The lab created opal in this ring is a top quality synthetic opal grown under laboratory conditions. The manmade opal's chemical composition is the same as natural opal with the exception of water content. Australian opal contains about 4% water and lab created opal contains no water. Instead the water is replaced with resin. The resin gives the synthetic opal more durability and helps to resist cracking. Laboratory grown opal gives you all the fire and colors of top grade natural opal at a much more affordable price with increased durabity.